By what can the audio quality of a professional film be characterized? It is the accurate mixture of background sounds, music, speech and of course voice over. Voxengo Voxformer optimizes voice recordings (if needed even music and musical instruments) and therefore helps even untrained speakers to gain more presence and clarity. 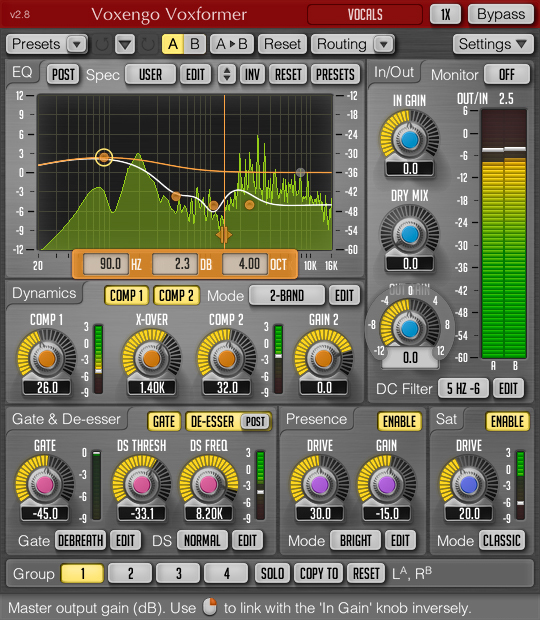 If you wish you can also optimize the results further and save own presets for later usage. Voxformer is designed to optimize singing and speaking voices without distorting them or giving them a synthetic sound. Compare yourself the results of Voxformer with those of other compressors which often cost many times more than Voxformer. Of course it is also possible to defamiliarize your audio by using special effects. You can make an audio sound like it’s being played on radio or through a telephone. But the most fascinating feature of Voxformer might be the ability to make a voice sound professional by using only one slide control. You neither have to be a sound engineer nor have to understand the complex algorithms which take effect. If you enjoy audio editing and would like to get deeper into the topic, Voxengo Voxformer offers you all options to tune your sound individually on a professional level. Furthermore it interacts perfectly with EDIUS 9. Whenever you apply a preset or change a parameter you can listen to the changes in your audio section by playing a loop in real time on the EDIUS timeline. That way you can optimize your sound in real time. If you want to edit your audio professionally Voxengo Voxformer plugin for EDIUS is highly recommended. Tip: Offering more quality Voxengo Voxformer VST Plugin is the ideal alternative for former iZotope VST 32-bit Plugin which do not run anymore in EDIUS Pro 7 and later versions.